Products: Rhino 4.0 with some NVIDIA and ATI cards, usually older ones. The same card may react differently on different computers. 1. Get the latest driver from the video card manufacturer. If it is NVIDIA, pick here. If it is ATI, pick here. 2. Set OpenGL Pipeline to Windows. In the dialog on the right, under Pipeline controls, set the list control to Windows, not OpenGL. 3. Do not use OpenGL for drawing feedback. 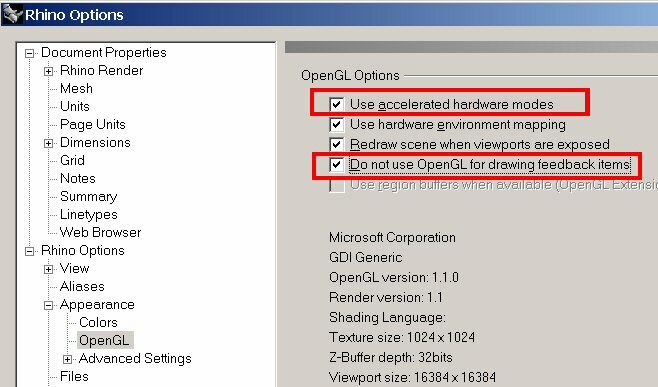 In the dialog on the right, check Use accelerated hardware modes and Do not use OpenGL for drawing feedback items. In some cases, this causes some minor side effects like things not being redrawn instantly. 4. Turn Off Vertical Sync in the NVIDIA driver. We did it by right-clicking on the Windows desktop, pick Properties. From Properties go to the Setting tab, and pick the Advanced button. On Advanced, you will see a tab for the NVIDIA GeForce control. We found it under 3D Controls. There was a list of settings. Towards the bottom you will find vertical sync. In the list control set it to force off. Note: This is NVIDIA's driver so the location of this option may change. Please direct any question about locating Vertical Sync to NVIDIA.